35 lbs of turkey to cook and we used this amazing brine to prep the bird before cooking him… for most of the following day!! Repeat this process until there is enough brine to cover the whole bird in a bucket/container/cooler (whatever receptacle you are using) or in the case of the bird in the photo it was a large rubbermaid container!! Keep bird submerged for 12-24 hrs and then roast as you usually would! The rough guide for turkey roasting is 20min per pound at 350°F. This is for a thawed or fresh bird, if you are starting from a frozen state you’ll need a little longer… But it’s always good to thaw your bird in the fridge before cooking anyway! The final internal temperature of the bird should be 165°F and although it is not reccomended to cook stuffing inside the cavity anymore but if you are a rebel like me and still do, the stuffing should also reach a temperature of 165°F also! Steve decided that we needed a “bigger” than your average grocery store bird for this particular gathering, when he arrived home this became a mild understatement! So he conferred with a co-worker and friend who grows turkeys and lined up to buy one from his family! If you are a regular reader you know we have raised a little bit of everything here but turkeys have not been one of those things we have tried yet! Although one day I would like to. Steve returned home with the bird and at 35lbs my jaw dropped, where on earth were we going to cook this thing? 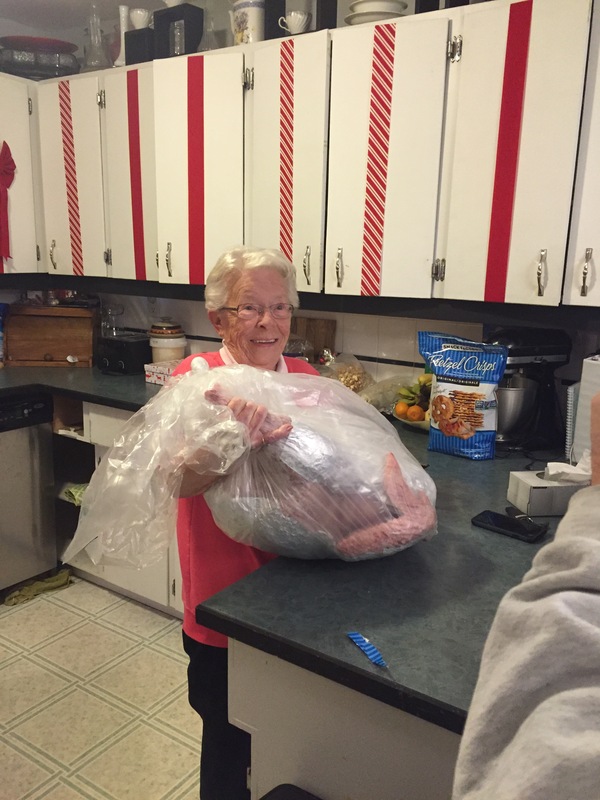 We made the brine… We submerged the bird into a huge Rubbermaid container and let it sit in our cold porch filling ice as we needed for the next 24 hrs. Friends of ours were having a holiday party and so we headed down the road and proceeded to have a few too many beverages and to stay up just a little too late (or early in the morning as it were) and by that time we needed to get this humungous bird stuffed and in the oven, so while I mixed up enough stuffing to fill the cavity Steve fought, wrestled, and struggled to make the bird fit in a roasting pan, and that was the little battle, the big battle was to follow and it would be when the two of us attempted to load the big fowl into the oven… I felt much like the mean old witch from Hansel and Grettal – and how fitting, there was even a house made of candy on the counter! We shoved and adjusted and maneuvered and finally got the door shut and the oven turned on! Then we laid down for 20 whole minutes before the children began to wake up! For the remainder of the day we were exhausted but our house smelled delicious and that night, and for MANY after we ate delicious bite after bite of that ginormous bird!! « My Baby is 2! Wow! What a bird. Thanks so much for the brine recipe. I always make a rub for my turkey. I think I’ll try your brine instead next time. I enjoyed reading your story. Lol. Have a great day!